Photo 01: The aircraft is Me Bf 108 KG+EM, one of only two aircraft operated by Sonderkommando Blaich in North Africa in spring 1942. The other aircraft was a Heinkel He 111 bomber. This tiny unit was set up specifically to counter the British Long-Range Desert Group and SAS in the desert. Theo Blaich, the commander of the unit which carried his name, was aware that the Free French held the outpost of Fort Lamy (nowadays known as N'Djamena) in Chad. This was of major strategic importance to the Allies as a resupply base. Shortly before General Rommel launched a major offensive with his Afrika Korps in January 1942, Blaich persuaded Rommel to allow him to attack the fort. However, this attack would require a round trip of some 2,500 km, well outside the usual range of German or Italian aircraft based in North Africa. Therefore, Sonderkommando Blaich was set up specifically for this mission. 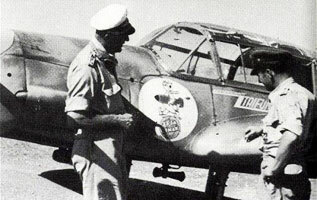 On 21 January 1942 the unit set off, the Messerschmitt Bf 108 accompanying the Heinkel from their base in Libya. The aircraft achieved total surprise and successfully bombed Fort Lamy, destroying all oil supplies and 10 aircraft on the ground. The aircraft was a He-111 H-6 Put the skin in either the He-111 H-2 or He-111 P-2 skin folder (the He 111 P looks more authentic, but the H-2 is problably closer performance-wise). Setback's skin: Desert He 111 from the 'Sonderkommando Blaich' raid. This skin represents one of the aircraft that participated in the daring Sonderkommando Blaich raid on Allied Free French forces at Fort Lamy, North Africa, in January 1942.